SANTO DOMINGO, Dominican Republic — Jude Payoute of Atlanta tried to cancel his $6,000 family vacation here after learning about calls to boycott this Caribbean nation for denying citizenship to thousands of Haitian descendants. Posted in Uncategorized and tagged USA TODAY on August 4, 2015 by Yamiche Alcindor. BALTIMORE – Delilah Spriggs shrugs at the burned-out CVS pharmacy store looters set ablaze Monday. She sees it as just one of many blighted sites in a neighborhood filled with abandoned spaces. For Spriggs and many residents of this city, the destruction left behind by Monday’s violence following the funeral of a man who died in police custody is simply the latest consequence of poverty and frustration grown from many years of neglect. While many residents condemned smashing windows and stealing goods, others say the vandals unleashed long-held anger to get the attention they had sought for years. Now national attention is fixated on Baltimore after 10 days of protests following the death of Freddie Gray, 25, a black man who died of a severe spinal injury April 19 while in police custody. Tensions exploded into violence Monday. Clashes between police and demonstrators led to arrests of more than 200 protesters and injuries to 20 police officers. Springs, a social worker, said the national attention should shift from the unrest to its underlying cause – the poverty that has robbed many of their homes and businesses. The neighborhood needs more grocery stores, healthier food options and better schools, she said. FERGUSON, Mo. — Barry Perkins threw a rock at a line of officers at the Ferguson police station Monday night and thoroughly enjoyed it. For a moment, Perkins said, he felt powerful. In the weight of that rock, Perkins delivered the anger and frustration stored up inside from years of harassment from local police officers who he says stop him frequently and search his car. Perkins, who admits to a criminal past that includes dealing drugs and car theft, says that more than once officers have thrown him to the ground. As police ducked and scrambled to safety, Perkins relished a fleeting sense of victory. Posted in Uncategorized and tagged USA TODAY on December 2, 2014 by Yamiche Alcindor. ST. LOUIS – As the world discussed the implications of Michael Brown’s death, his mother sat alone in a plush hotel room full of people, silent, stoic and staring at her phone as she awaited word from the grand jury. When the word came, attorney Benjamin Crump fielded the phone call. “The jury was not inclined to indict on any charges,” he said. Lesley McSpadden, Brown’s mother, screamed and sobbed. Posted in Uncategorized and tagged USA TODAY on November 24, 2014 by Yamiche Alcindor. St. LOUIS — Lesley McSpadden waits for the crowds and the cameras to leave before she turns back to her son’s casket to kiss it goodbye. Her moment to pay her last respects to her son, Michael Brown, came after his death from a police officer’s volley of gunshots, three autopsies and violent demonstrations in nearby Ferguson. It’s been two weeks of balancing grief with responsibilities. The teen’s parents have struggled with constant crying fits and sometimes paralyzing despair. While the country has remained fixed on the vivid, tear-gas laden confrontations between police and angry residents in Ferguson, Brown’s family has been trying to cope with the media spotlight and a world without their son. The family granted a USA TODAY reporter exclusive access to Michael Brown’s funeral and memorial services. Posted in Uncategorized and tagged USA TODAY on August 25, 2014 by Yamiche Alcindor. NEW YORK — Jonathan Fleming is finally getting some rest, even if he’s sleeping on a cousin’s couch in Brooklyn after spending 24 years in prison for a murder he didn’t commit. 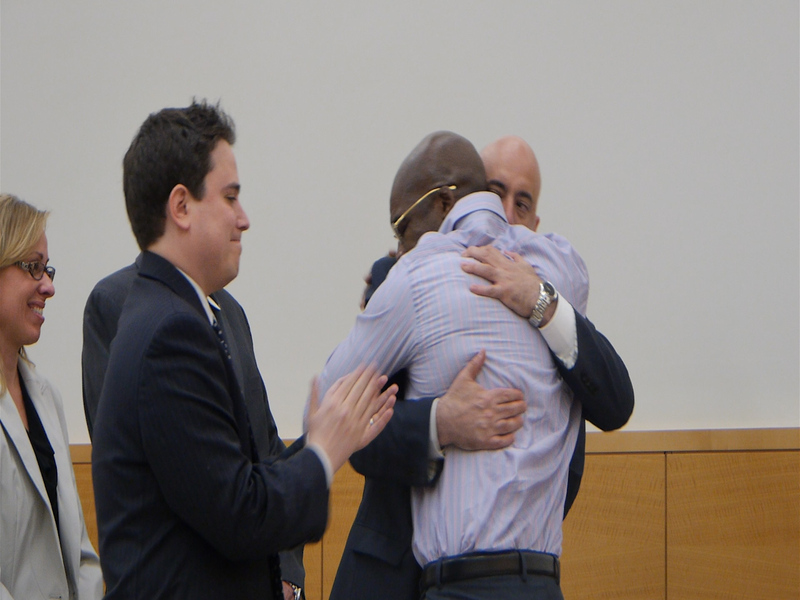 Fleming, 52, was wrongfully convicted of second-degree murder in New York. He walked free on April 8, 2014. More than a dozen news cameras crowded into and around the Brooklyn Supreme Court building to capture the moment. Nine days later, Fleming, minus the fanfare, stood in line to collect food stamps. He hopes to find a job and is looking for a permanent place to live. And, it could take years before he receives any lawsuit settlement payments from New York, even though it is one of 29 states with compensation laws. A stranger set up an Indiegogo fundraising campaign that has collected more than $45,000 for him. It’s open for donations until May 9. Fleming will live on that money and a loan against the compensation he expects to get from the city and state of New York. His lawyers say they are aiming to get him at least $6.4 million after another New York City exoneree received that amount recently. In the meantime, Fleming is living in the vulnerable period that dozens of others face. It takes an average of three to seven years for the wrongfully convicted to receive compensation, experts say. A record-breaking 90 wrongfully imprisoned people were released from prison in 2013, according to the National Registry of Exonerations, a project of the University of Michigan Law School and the Center on Wrongful Convictions at Northwestern University School of Law. This year, already 31 exonerees have been set free. Posted in Uncategorized and tagged USA TODAY on May 27, 2014 by Yamiche Alcindor.